LOS ANGELES – Estadio Cubierto Newell’s Old Boys in Rosario, Argentina will be the place to be for Argentine boxing fans on Friday, August 27 as Lucas Matthysse and Sebastian Lujan step into the ring against seasoned foes in bouts which will be broadcast throughout Latin America on HBO Plus’ “Next Boxing Generation” and on TeleFutura’s “Sólo Boxeo Tecate” in the United States and Puerto Rico. In the 12-round main event, the WBO Latino junior welterweight title will be on the line when the unbeaten Matthysse takes on Mexican veteran Rogelio Castaneda in a highly anticipated rematch of their 2008 bout. The co-main event of the evening, scheduled for ten rounds, will see Lujan tackle Colombia’s Emilio Julio for the WBC Latino welterweight title. Both bouts, which are presented by Golden Boy Promotions in association with Arano Box Producciones, will air live on the HBO Plus service in Latin America beginning at 10:00pm local time (9:00pm ET). In the United States, the TeleFutura broadcast, which will feature Matthysse vs. Castaneda, will begin at 11:30pm ET / PT (10:30pm CT). The doors open at 7:30pm and the first bell rings at 8:45pm (local time). Tickets, priced at 40 pesos, 70 pesos, 90 pesos and 120 pesos are on sale now and available for purchase at the Estadio Cubierto Newell’s Old Boys box office. Unbeaten as a professional, the only blemish on the record of Trelew, Argentina’s Lucas Matthysse (26-0, 24 KO’s) is a 2008 no contest against Rogelio Castaneda in a bout that was prematurely ended after an accidental clash of heads cut the Mexico native in the third round. Since that bout, Matthysse has not missed a beat, winning four in a row, including a fourth round stoppage of former World Champion Vivian Harris in his most recent bout this February. Now, he’ll look to settle the score with Castaneda. 34-year-old Tijuana, Baja California, Mexico veteran Rogelio “Cachorro” Castaneda Jr. (26-15-3, 8 KO’s) has been in with a high level of competition from the time he began his professional career in 1996, including 14 undefeated fighters. Eager to finish what he and Matthysse started in 2008, Castaneda is primed and ready for a career-defining performance on August 27. Unbeaten in his last seven bouts dating back to 2007, Rosario, Argentina’s Sebastian “Iron” Lujan (33-5-2, 21 KO’s) is looking better and better with each passing fight. In May, the 30-year old knocked out Jailer Berrio in five rounds to win the vacant WBC Latino title and on August 27, the former world title challenger will defend his belt for the first time in front of a legion of hometown fans at Estadio Cubierto Newell’s Old Boys. Barranquilla’s Emilio Julio (16-7-1, 8 KO’s) is a rugged competitor who has been waiting for an opportunity to move up the welterweight ranks. A hard-hitting battler with an unyielding will to win, he’ll have his chance to take the next step in his career against Lujan. “Next Boxing Generation,” which was launched in August of 2008 by Golden Boy Promotions in association with HBO Latin America Group, features the top up and coming Latin American fighters in boxing today in exciting bouts that will appeal to fans across all demographics. 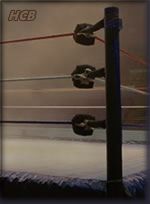 The series has seen fights take place throughout Mexico as well as in Argentina, Colombia, Panama, Puerto Rico, the United States and Uruguay. For more information, visit www.goldenboypromotions.com, follow us on Twitter at www.twitter.com/GoldenBoyBoxing or visit us on Facebook at www.facebook.com/GoldenBoyBoxing.